Soft Matter encompasses a wide range of systems of varying components,including synthetic and biological polymers, colloids, and amphiphiles. The distinguishing features of these systems is their characteristic size, which is much larger than that of their atomic counterparts, and their characteristic energy, which is much smaller. Because of their ability to assemble themselves into complex structures, they form the major components of biological systems and technological applications. phase behavior of mixtures of homopolymers with block copolymers. With contributions from highly acclaimed experts, it differs from the very specialized or proceedings-type books currently available. 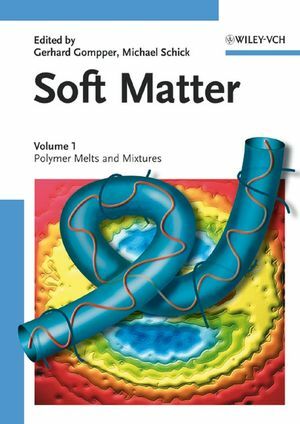 Aimed at both graduates and researchers, the book is an introduction to soft matter physics as well as a concise reference for those already working in this field. Institute for Solid-State Physics at the Research Center Juelich and as a full professor at the University of Cologne. He was recently honored with the Erwin-Schroedinger-Award for interdisciplinary research on the efficiency-boosting effect of amphiphilic polymers in microemulsions. of block copolymers and of lipids, and the fusion of biological membranes. He has been honored with Fellowship in the American Physical Society, and a Humboldt Foundation Research Award spent at the Ludwig-Maximilians-Universitaet Muenchen where he worked with Gerhard Gompper. He is married to the scholar of Norwegian Literature, Katherine Hanson, with whom he lives on their floating home in Seattle's Portage Bay. He is an avid, amateur cellist. "Considered as a whole, these two volumes form a good beginning to a comprehensive treatment of this fast-growing field of research. One certainly hopes that the series will be extended to cover some other, equally important, aspects, such as the glass transition in colloidal suspensions. These volumes definitely belong on the desk of every experimentalist working in this field, and they will undoubtedly also be useful for introductory courses on this subject." "...a unique series, holding great promise, strongly emphasizing the current state of the art in this field, as well as looking towards the future, and by doing so, inspiring new generations of scientists. Overall, this is an excellent and most useful initiative, which can be highly recommended to the research community and to advanced graduate students primarily in physics. However, physical and colloidal chemists and materials scientists will also benefit from this work."